"Ernest and Celestine" is the coziest movie you'll likely see all year. Every frame is suffused with a fireplace kind of warmth that, for me at least, cast an immediate spell that didn't let up. The French-produced animated movie is skewed to kids, and unlike today's animated product from Hollywood, it isn't self-consciously concerned with making an appeal to adults: this simple story of an unlikely friendship between a mouse and a bear in a funny-animal world doesn't have any pop-culture jokes or winking irony. But it's the overall integrity of the movie, directed by Stéphane Aubier, Vincent Patar, and Benjamin Rattar, adapting Belgian children's books by Gabrielle Vincent, that's key to its charm for children of all ages. The movie begins in a kind of mouse orphanage, whose overseer tries to scare her charges with tales not of big bad wolves but big bad bears. Soon after this, mouse-dentist-in-training Celestine endures a tooth-hunting mishap that puts her out in the street for a night. She's discovered by grumpy, hungry, far-from-home and out of sorts bear Ernest, who thinks the mouse would make a tasty snack. She talks him out of it, shows him how to break in to the storeroom of a nearby candy store, and so the adventure begins, and a friendship, soon to be disapproved by the authorities of both bear and mouse society, is born. The drawing and animation style is a big part of what makes the movie so special. The characters look hand-drawn and aren't overly elaborate; the settings are meticulously designed but sometimes minimally rendered. The colors are gentle but rich, like really well-coordinated watercolors. The less-is-more sensibility is a little bit deceptive, because the action sequences—and there are quite a few of them, as society's disapprobation of our title characters leads to a chase or three—are beautifully animated. Not as elaborate as what you get in early Miyazaki, but they convince. 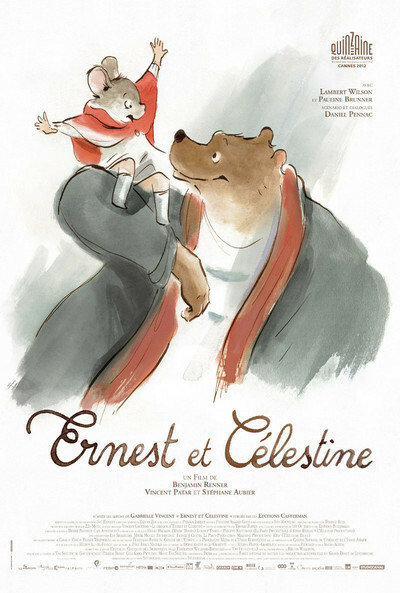 And throughout, the atmosphere is so gentle, even when the dyspeptic bear is acting out his grumpiest sides, that the world of "Ernest and Celestine" looks like an ideal one. Which ties in to the movie's ultimate message, a good one for children and adults alike, a message about how our superficial differences ought not be any impediment to friendship. For the record, I viewed the French-language version of this movie, which features Lambert Wilson and Pauline Brunner in the title roles; the English-language version gives Ernest to Forrest Whitaker and Celestine to Mackenzie Foy (Renesmee in "The Twilight Saga: Breaking Dawn") and I have every reason to believe they, as well as Lauren Bacall (who has also lent her voice talents to a Miyazaki movie, as I recall) do a bang-up job.